Place whole eggs in bowl and whisk with a fork. 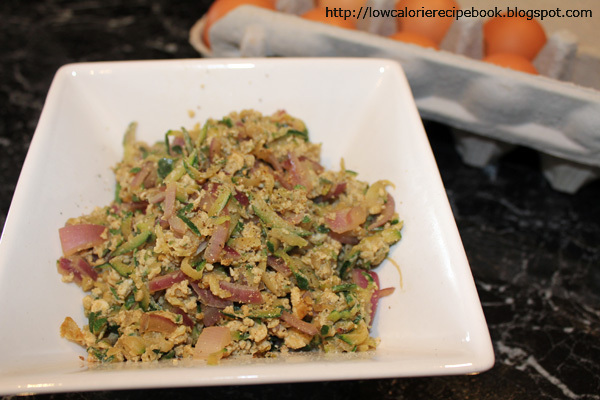 Grate zucchini and ginger and dice onion. Heat a nonstick skillet and add olive oil. Add zucchini, ginger and onion and soy sauce and slowly saute until 1-2 minutes or until onion is transparent. Add egg and yeast at once and stir quickly as the mixture cooks. Serve. Note: I like to have whole egg meals as well as egg white as the yolk is full of goodness and more filling. If you decide to substitute the egg yolks in this recipe, replace then with two extra egg whites (4 total). The calorie count for the adjusted recipe will be 177 Calories.